New app puts the iPhone X's 3D depth-sensing tech to good use. The 3D sensing technology behind Face ID is reportedly two years ahead of Apple’s rivals, and developers are keen to take advantage of it. A new app, created by the Silicon Valley computer vision company Bellus3D, uses Apple’s TrueDepth camera to create detailed three-dimensional selfies. Called Bellus3D FaceApp, the iPhone X exclusive app is currently in beta. It offers users high resolution face scans of the kind that were only previously possible to achieve using expensive professional 3D scanners. Check out a demo video below. The app works by capturing more than 250,000 different 3D data points on a user’s face. To perform the scan, the app asks you to slowly turn your head for a period of 10 seconds. After this, the user’s voice is virtually reconstructed in 3D, where it can be rotated and zoomed using an iPhone X. You can save the 3D selfie video to your camera roll photo album, and you’ll even be able to post your 3D selfie to Facebook. 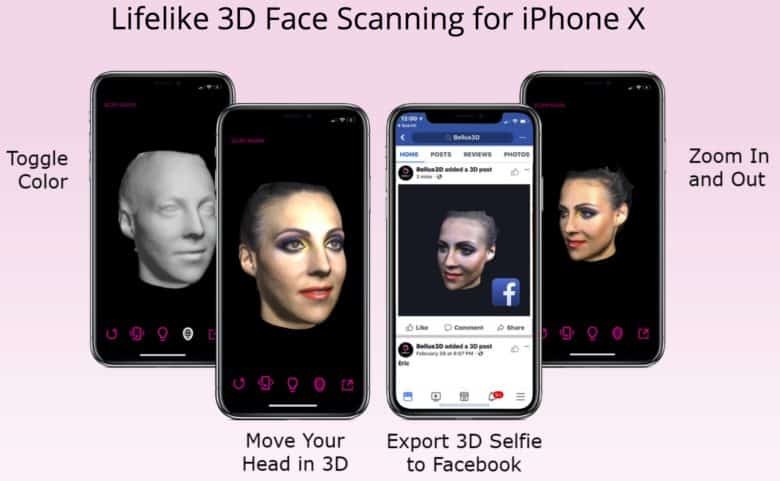 Bellus3D claims that its app is the first to use the iPhone X TrueDepth camera for high-resolution 3D face scanning. Potential applications could include mobile gaming, custom eyeglass design, virtual 3D make-up sessions, medical applications, and more. Right now, the app isn’t available through the App Store, although you can sign up for a beta version here. The company is also planning to release a Face SDK for iOS to allow third party developers to add high-resolution 3D face-scanning capabilities to their own iPhone X apps.